On this page you can purchase Balanced Scorecards as a stand alone products or in the pack. All scorecards are available as a trial versions, so please, try the evaluation version before placing order. After the purchase you will have a links to download the version of Balanced Scorecard in Excel file. Also, the scorecard will be available for download as a .bsc file. The .bsc is a format of Balanced Scorecard Designer, so if you wish to have ability to edit and create your own scorecards, you should also purchase a Balanced Scorecard Designer. CRM Balanced Scorecard for 60 US$, add to shopping cart. Help Desk Scorecard for 60 US$, add to shopping cart. Call Center Balanced Scorecard for 60 US$, add to shopping cart. Product Knowledge Management for 60 US$, add to shopping cart. Call center outsourcing metrics for 60 US$, add to shopping cart. Interactive Voice Response for 60 US$, add to shopping cart. The pack includes: CRM + Help Desk + Call Center Balanced Scorecard for 144 US$ (180$, 20% off), add to shopping cart. Purchase CRM Metrics Pack, 6 units for 252 US$ ($360, 30% off, save 108 US$).The pack includes 6 CRM related metrics: Customer Relationship, Call-Center, Help Desk, Interactive Voice Response, Call Center Outsourcing, Product Knowledge Management metrics. 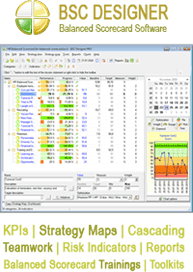 BSC Designer is a program that was used to create Balanced Scorecard Metrics, you can use it to create your own new metrics or modify existent. Purchase Balanced Scorecard Designer for 270 US$, add to shopping cart.